Neuroscience textbooks often suggest that the ability to image the structure of the brain in living patients started in the 1970s with the introduction of the CT scanner. What they tend to forget is that brain surgeon Walter Dandy was already neuroimaging patients as early as 1918. We think of x-rays as only being useful for getting pictures of bones but soft tissue does show up on an x-ray. The images rely on certain bits of the body having a higher density and therefore blocking more of the rays falling on the photographic plate. Bones are obviously very dense so show up well but look at this image of a hand x-ray. You can clearly see the difference between bone, flesh and air. What you can’t see is any difference in the soft tissue. The crucial difference that struck Walter Dandy was the possibility of distinguishing flesh and air on an x-ray. Knowing that the brain is surrounded by cerebrospinal fluid (CSF), which also fills internal spaces called the ventricles, he decided to simply replace the fluid with air and x-ray the patient. He published his first results in 1918. He described how he drilled a hole in the skull of a patient and carefully removed the CSF from the ventricles and replaced it with air. Now known as ventriculography, one of the images he took is illustrated on the top left. For the first time, you could clearly see the ventricles in a living patient. During the procedure, he noted that some of the air has escaped the ventricles and was occupying the space between the skull and the brain. The following year he published another study where he deliberately filled this space with air as well, so the surface of the brain was surrounded by the gas and so could show up on an x-ray. 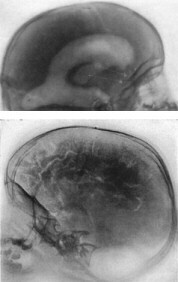 The bottom left image shows the result of this, and you can see it clearly shows some of the ‘trenches’, the cerebral sulci, on the surface of the brain. Now called pneumoencephalography, the procedure was immensely useful, but, extremely unpleasant. In his 1918 article he noted that the patient’s reaction “was characterized by a rise of temperature, nausea, vomiting, and increased headache”. Furthermore, it takes weeks, if not months, for the CSF to be replaced by the body, leaving the patient in a debilitated and fragile state. However, it was used throughout the 20th century and the research literature is peppered with the results of this early neuroimaging research. Link to 1918 paper on imaging of the ventricles. Link to 1919 paper on imaging the brain surface. That’s really interesting. And the early pictures of brain imaging (1918!) fascinating. But! The idea of drilling into someone’s head and replacing fluid with air! It makes me shudder to think of someone treated that way. At the age of three weeks, I was diagnosed with hydrocephalus. My maternal grandmother was Radiology Administrator at UCLA at the time. Apparently my doctors wanted to perform a pneumoencephalography on me at the time; my grandmother instructed my parents to refuse. Reading this article gave me a better understanding of what I would have faced both during and after the procedure. Thank you.